I have this on the LP blog actually, only now I've worn it a few times. It's interesting, because often there's a problem putting a flat stone in front of a necklace. On many designs, the flat bead will turn sideways and stick straight out instead of lying flat. 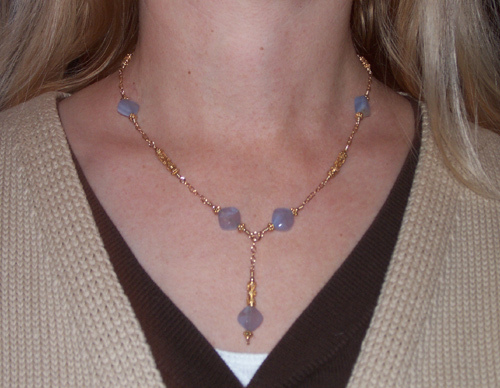 This is particularly true of a string of flat beads; it looks nice, but is impossible to wear. This works somehow. I suspect it has to do with the stone itself--it's cut so there's slightly more weight on one side of it. As long as you face it correctly, it'll stay flat. I didn't change much, it's just longer in the back (the two blue beads in back were too high before), and the wrapping is much nicer. Here the only screenshots that don't come out, are of posts with Youtube videos embedded in them (and typically, multiple videos)...which I can live with.